4-Word Review: He follows her around. This film, which is based on the Peter Schaffer play, deals with Charles (Michael Jayston) an uptight British accountant who thinks that his wife Belinda (Mia Farrow) is having an affair. 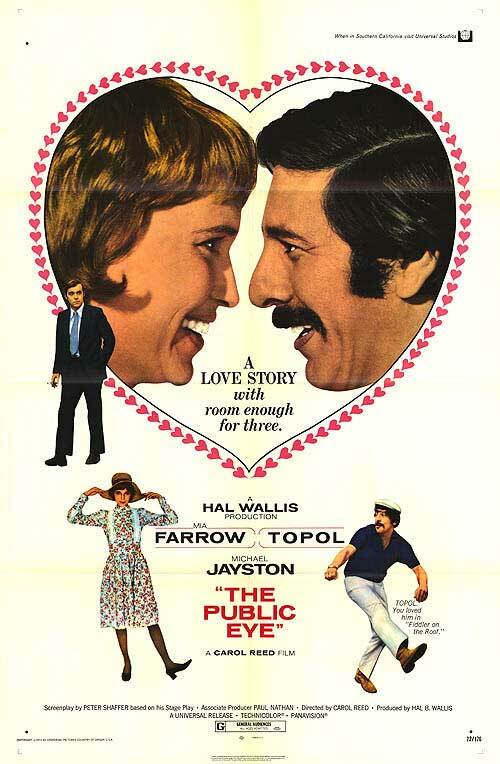 He hires Julian (Topol) a goofy private detective to follow her around and see where she is going and what she is doing everyday while he is at work. Unfortunately for Charles Julian starts to fall in love with Belinda as he is following her and she in him, which only further complicates matters since she was initially not seeing anyone and all those trips that Charles thought were so suspicious were simply innocent excursions. The biggest problem with this film is that it is too lightweight probably more so than even other lightweight films. Nothing really happens. Julian just follows Belinda around much to her amusement, but the two don’t share any dialogue nor ever consummate their pseudo-relationship. The film simply spends long drawn out sequences showing the two following each other throughout the streets of London and occasionally giggling at their ‘little game’ and that is about it. You keep waiting for that second act to kick in, but it never does, which after 95 minutes starts to make the whole thing almost pointless. Topol is miscast in the lead and ends up being the film’s weakest link when he should have been the strongest. He was fresh off his award winning performance in Fiddler on the Roof and this movie was supposed to make him into a leading man, but the attempts at turning him into a variation of Inspector Clouseau fail badly. His bright white suit that he wears looks garish and ridiculous especially for an undercover spy. Watching him constantly stuffing his face with food starts to get obnoxious and his buffoonery becomes more annoying than engaging. Farrow is appealing and her natural child-like fragility is perfect for the part. The scene where she states to the shock of an upper-crust crowd at a formal dinner party that rapists should be punished by having their ‘thing’ cut off publicly is amusingly edging and the film would have been better had it gone a little more in this route. Jayston is the one that comes off best. He plays the proper British gentlemen with all his staid mannerisms perfectly. What I really like though about him is the fact that he does love Belinda, but just doesn’t know how to show it effectively. This was an odd project for legendary director Sir Carol Reed whose final film this was. The story doesn’t allow for much visuals although the way Reed captures London both from aerial shots as well as the downtown streets that Belinda visits is excellent. The movie almost seems to work as a tour guide of London, which in some ways is the best thing that can be said about the film. This entry was posted in 70's Movies, British Movies, Comedy, Foreign Films, Movies Based on Stageplays, Obscure Movies, Romance and tagged Carol Reed, Entertainment, Mia Farrow, Michael Jayston, Movies, Review, Topol. Bookmark the permalink. This sounds incredibly boring, I have to say. There’s charm here, but it is slight!